Have you ever had car trouble, but no food in the house? Maybe you commute for work and don’t know where to find coffee everywhere you go. Sure, we all have GPS on our phones, but who has time to try navigating a strange part of town during the work day, especially before even having coffee? Thanks to modern technology, we can now order a variety of goods and services, right on the spot. This company has a unique model wherein all of the drivers are part owners of the company. 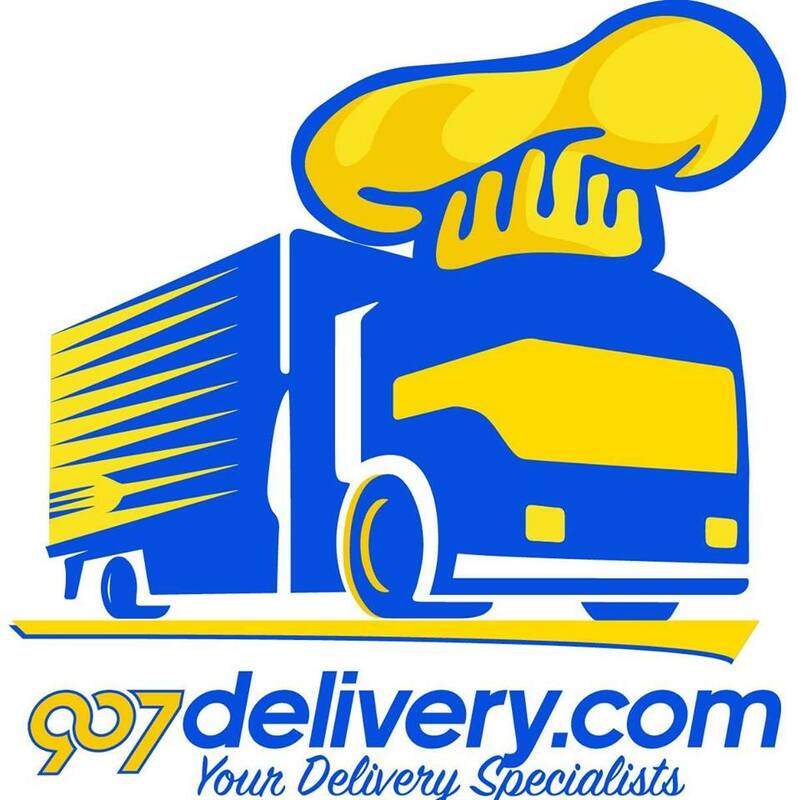 When asked whether anyone inquiring employment could just enter the company as a contracted driver, Dean Bradshaw – co-owner and co-founder of 907 Delivery – explained that the matter would have to be discussed with all of the owners. Their collective goal is to reach 70% capacity before they would be ready to expand ownership, and they appear to be well on their way. 907 Delivery is true to its name – a delivery service in the 907, and surrounding, area code. It is an incredibly convenient service to the people of Anchorage, AK and neighboring zip codes. As a traveller, this is especially helpful in getting my needs met while visiting this beautiful city. Due to their structure, this company takes pride in their quality of service. Every driver represents the brand and is invested in its success. 907 strives to provide a convenient service for its customers and vendors. They try to make certain guarantees when it comes to important factors like added fees and delivery times. The standard quote time for deliveries is 60 minutes, however, their actual goal is to deliver between 30-45 minutes. A range of factors must be considered when estimating delivery times. Some of 907’s vendors are gourmet restaurants that can take up to 90 minutes even for a pickup order, during peak times. Delivery times are determined by an average, and one of the advantages of 907 is that their owners make sure they are intimately familiar with the area and its businesses. Another way they attempt to set themselves apart from the competition is by offering better incentives – in terms of fees – to their vendors. One of their aims is to support local business. This is a major reason why 907 Delivery charges the vendor a fraction of the percentage of some competitors. Currently, the only fees incurred by the customer are delivery and gratuity fees. Gratuity is based on a percentage of the sale, while the delivery fees range anywhere from $8-$20, depending on the area and the business. Some featured and regular businesses actually offer free delivery specials. 907 is considering applying service fees to customers in the future, varying by vendor. The company is at the beginning of a promising incline to the top of their industry. The most immediate expansion site in the lower 48 is set on Las Vegas, which is a hub for today’s small business enterprises. As a small, tight-knit group, their current process is to have one of 907 Delivery’s current owners explore a market and arrange the expansion. Whichever owner so shall choose will run that market. 907 Delivery is wide open for success. The market is undeniably fertile and the service undeniably valuable. When you’re having a viewing party – you don’t want to miss a minute of the game but everyone’s asking for wings – call 907 Delivery. What about the times you’re experiencing terribly dismal Alaska weather? 907 Delivery is a great solution. Perhaps the wine is flowing at your regular girl’s night movie and now everyone has a craving for chicken and waffles, yet no one can drive. You could call a car to carry you back and forth to a restaurant, or, stay comfortably cuddled under warm blankets, while patiently waiting for deep fried poultry. Maybe you’re a well meaning parent whose teenage children are hungry at home without licenses. Whatever the situation in need of a delivery service, in or around Anchorage, 907 is worth a call. Visit 907 Delivery today to find out which business in the “mall of deliveries” is available near you. Hey Buddy!, I found this information for you: "907 Delivery 101: Areas, Hours, Fees". Here is the website link: https://all2door.com/907-delivery/. Thank you.